If you came here looking for a snake tank, then you have made the right choice. Here at Waterlife Aquarium and Reptile Supplies in Hoppers Crossing we stock a huge range of snake tanks. When buying a snake tank, you can choose from between 2 different types. There is the Melamine Timber snake tank and the other one which is the Glass snake tank. We will explain the difference between these two types further down this page. Check out the video below of some of the different types of snake tanks we have for sale. The GLASS snake tanks are much easier to clean in comparison to its Wooden counterpart which needs extra care in cleaning especially when using water. When buying a Wooden Melamine snake tank, it is recommended that you line the timber joins with small dab of silicone to prevent water from getting into gaps and damaging the timber. Glass snake tanks tend to last longer whereas Wood Melamine will deteriorate over a period of time. GLASS snake tanks are best suited for semi-aquatic species. WOODEN snake tanks are much better at holding temperature than glass snake tanks because heat escapes faster in glass than wood. In terms of the price, tanks made from either glass or melamine are about the same. ALL snake tanks need to have adequate ventilation. By adequate ventilation it means that there shouldn’t be condensation build up on the inside of the glass tanks. Ventilation is very important as humid environments for most desert dwelling snakes and lizards will cause respiratory infections. Both our Melamine Wooden Tanks and our Glass Tanks for sale at our store have the recommended level of ventilation allowing sufficient airflow. Irrespective of what type of tanks you choose you will need to add the correct type of lighting and heating according to the animal you are keeping. For more detailed information on the Wooden and Glass Snake Tanks click on the buttons below to get the Product Information Sheet. Learn how to take care of your snakes/pythons by downloading these care sheets. Do Snakes/Pythons Need UV Light? For many years reptile keepers have been under the assumption that they do not require Ultra Violet Light. UV light regulates the production of Vitamin D3 which allows pythons/snakes to properly absorb and metabolise calcium. Most keepers have kept their animal without UV for many years without any issue as they believe that the python will get enough calcium from the rats and mice that they are feeding. Correct! There is enough calcium in the food they eat, but does their body absorb the calcium into their system well enough without the UV Light? This is where you as a snake keeper need to decide as there is so much conflicting information. In summary UV light will definitely have a benefit for your snake or python. 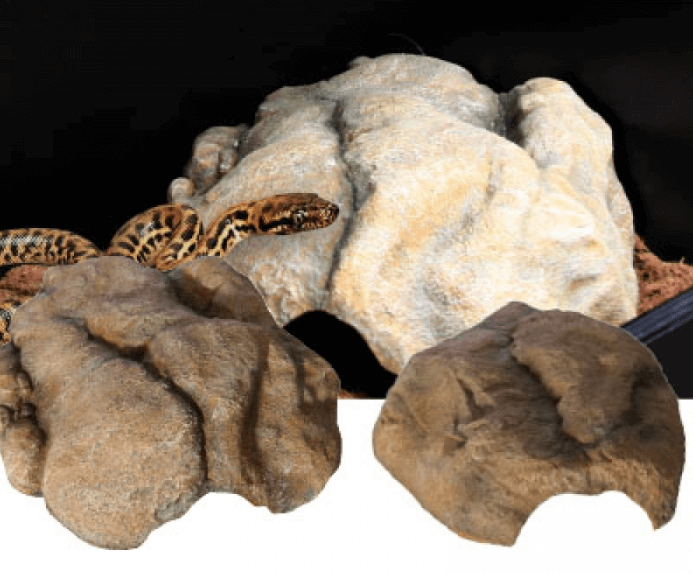 It is important that you keep your snake enclosure stress-free to maintain optimum health for your snakes. It is natural for snakes to hide in holes, under rocks and logs to protect themselves from predators. You must support this natural behaviour by offering some hiding spots inside the snake enclosure. In our reptile department at Waterlife Aquarium we have a great range of snake caves and hideaways to choose from. Got Enquiries on Choosing the Right Snake Tank? If you live in Melbourne and you are interested in buying a Snake Tank, please CLICK ‘Enquiry Button’ or call us NOW.